"Traditionally, ham is rubbed with brown sugar and other sweet ingredients. 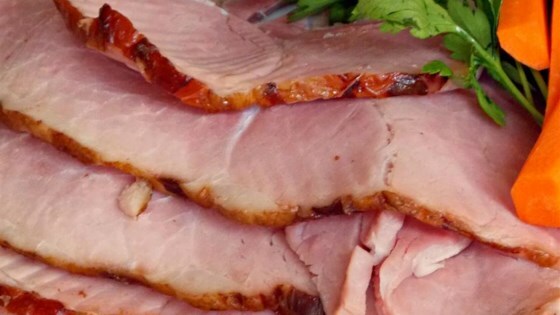 I like my ham to taste like ham and I like my recipes to be simple. Here's an easy recipe that I'm sure your whole family will enjoy." Arrange ham fat-side up in a large baking dish. Pour chicken broth over ham. Bake in the preheated oven until heated through, about 90 minutes, basting every 20 to 30 minutes. Discard broth before slicing and serving ham. I love ham that tastes like HAM. I would suggest using a Turkey sized oven bag to heat the ham - it really protects the meat and keeps it moist. Loved this. It allowed the smoke flavor in the ham stand out and was much better for left overs than a sweet baked ham. Did take longer than noted about an extra hour. I love this as my family also does not like sweet ham. I have made this many times and I add garlic cloves to the broth. Fantastic! Used an oven baking bag. Baked for about 2 hours. Made as is, just added some minced garlic to the broth and put a tent while cooking. Perfect.